With little prospect of peace in the world’s major trouble-spots, and without a sustainable and holistic solution to long-term human development needs, the number and vulnerability of the world’s refugee citizens is likely to grow. It is fitting therefore that we launch this series on 20 June 2018, as the international community marks World Refugee Day. In this blog series we’ll explore many related problems – and possible solutions – from both a justice and governance perspective. On average in 2017, a person became displaced every two seconds. Figures further indicate that a staggering 68.5 million people were displaced by the end of that year — and of that number 25.4 million were refugees. The majority of refugees flee to neighbouring countries; which tend to be among the low to lower middle income countries. Though three durable solutions were foreseen under the Convention relating to the status of refugees, namely, local integration, resettlement and voluntary return, their application is failing. Over two-thirds of all those registered at the UNHCR as refugees find themselves in a protracted refugee situation. In other words, they are part of a group of at least 25,000 people that has sought refuge in a particular host community and have been displaced for a period of at least five years. Humanitarian aid is often a critical component of survival for displaced populations with limited livelihood opportunities, broken social capital networks and lack of access to state-backed social protection systems in their country of origin. By nature, humanitarian aid is intended as a short-term relief focusing on basic needs provision, and faces a lack of long-term funding as many pledges are made on a year-to-year basis. It has not been capable of bridging the humanitarian-development nexus over the long term – thus, furthering aid-dependency. With this in mind, the pressing question is how to ensure a minimum if not a decent level of well-being for those facing displacement? This is imperative not just from a social justice perspective but also from a sustainable governance perspective. Consequentially, it becomes necessary to consider the role of social protection in times of displacement. Humanitarian social protection is a catchphrase that emerged following the World Humanitarian Summit in 2016. The Social Protection Inter-Agency Cooperation Board (SPIACB) released a joint statement calling for the inclusion of social protection within any strategy on forced displacement. Since then the UNICEF-Innocenti Research Office, among others, has led discussions on the evidence for social protection in contexts of fragility and displacement, underlining the urge to rethink social protection in times of need, especially post-disaster and conflict environments. Nonetheless, no clear consensus has been reached to date on what this should entail and what it should look like. Under the international legal regime, the right to social protection is very much enshrined. The right was first stipulated in the Universal Declaration of Human Rights. This was reconfirmed in the International Convenant on Social, Economic and Cultural Rights and many ILO Conventions. While the ICSECR in particular holds for state-led interventions and thus applies to nationals of a country, including internally displaced persons, refugees who have fled borders are still to be granted the right to social assistance as under the Refugee Convention. The Convention relating to the Status of Refugees calls for the extension of social security in the host nation to be accorded to refugees without discrimination. Yet in many host countries, this is not the case. 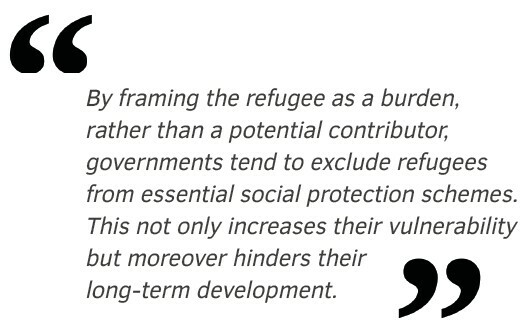 By framing the refugee as a burden, rather than a potential contributor, governments tend to exclude refugees from essential social protection schemes. This not only increases their vulnerability but moreover hinders their long-term development. Whether the discussion involves refugees or displaced persons, it should be recognised that each group is subject to a distinct legal system with different duty bearers. Different actors are also involved in terms of service design and delivery for those groups which would otherwise fall outside state-based social protection provisions. These actors range from international organisations and national governments to civil society (both international and local). This can result in incoherent policies and programmes, without universal eligibility, oversight or accountability and may lead to inefficient resource allocation and coverage gaps with significant impacts on lives. Humanitarian aid needs to be re-examined, and humanitarian social protection must be considered. We propose the construction of a humanitarian social protection framework composed of three layers: (i) international and national legal regime, (ii) programme development and (iii) the political economy of negotiation between the various actors involved. 4) The framework for humanitarian social protection. In the meantime, we welcome any constructive comments to further the international discussion on this topic.